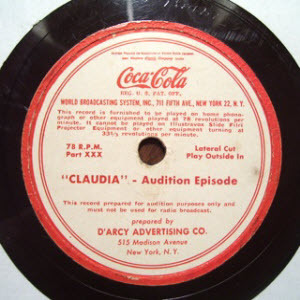 Claudia and David was a drama based on the Redbook magazine stories by Rose Franken and William Brown Meloney It began as a skit on the Kate Smith Hour June 6, 1941, a month before becoming a full summer series. Claudia was played by Patricia Ryan and David was played by Richard Kollmar. Claudia was still in her teens when she fell in love with David; much of the conflict derived from the possessiveness of her mother, with the "everyday drama" focusing on counting pennies, balancing checkbooks and repairing items around the house. The skits on the Smith show developed the romance; the couple would actually wed at "City Hall" in the second regular episode, July 11. A syndication attempt in 1947-48 sponsored by Coca Cola starred Kathryn Bard as Claudia, and Paul Crabtree as David. This is awesome OTR series, I have been listen, and its very true and good for family. The lesson it teaches on how to be nice and good with family in good and bad times, even how to behave and be with family when dealing with friends and neighbours. How to treat and be with family members when somebody else have bad reviews on the member of family. Truly the best series for all over world, it should be reviewed and encouraged to be played in other parts of world, where people are stick to radio or FMs these days..